So how's everyone doing? Getting ready for the holidays? Sorry for the lack of reviews, it's been a crazy busy week at work on top of preparing for Christmas and recovering from the weekend (no, I don't mean a hangover). However, with all that was going on, I managed to squeeze in a trip to Wegman's Tuesday night, but there are two catches. One, it's out of the way so I have to treat this as a special trip rather than just a regular grocery store. I figure I would probably find Wegman's cooler if it was down the street from me. Two, I got hosed at checkout. The checkout kid didn't bother to point out that I needed a shoppers club card to save $9 on $85 worth of groceries (that otherwise I would have bought from Market Basket at the lower price). Grrrrr. Sorry, focus, so I head to Northboro, home of the first Massachusetts Wegman's. I take a left at the light and head up the very long road to the top where I find a gigantic shopping plaza with Wegman's, Kohls, BJs, and a bunch of other places. I park in front of the mega sized Wegman's and head in. I head in and am surprised at the openness of it all. I dash into the "Market Cafe" which currently smells like barbecue sauce. I pass a soft pretzel cart, and some muffins that have been sitting out all day, and many of the same things I find at other stores. Sure I can't find Caribbean lime chicken at any old grocery store, but at the same time, I wasn't looking for it either. Oh there's sushi and kosher cooked chicken's (at double the cost), but again, don't care. Oh sure there is plenty of stuff here, but nothing I really want or that will safely survive the trip home. I move onto the all natural section. It's a decent size that is bigger than a standard organic section, but no where near as helpful as a whole foods or trader joes, so I move on. Next is chips, snacks, and all the other stuff. There are some good prices here and there. Wow, there is a big candy store section, that's different, but again, don't care. Enough disappointment, you just want to know about ice cream don't you? Well, before I went to the 140,000 sq ft Wegman's, I envisioned an ice cream aisle as far as the eye could see filled with freezer after freezer of my favorite treats. Instead I got an ice cream section that reminds me of the small grocery store I went to as a kid. How in the bloody blue world can you build an ice cream section this small in a store this big? No it wasn't teeny tiny, but I wanted to be wowed, and that just didn't happen. Hold on friends, it wasn't a total loss. and guess what was in the second one? Perry's!! Hola Fruta!! and Yovation!! hehehehe - even an Ice Cream Pizza!! Oh this is exactly what I was looking for! Oh I am thankful that this trip is not a total wash. Sure I was hoping for a much larger selection of Perry's, but what I got instead was 3 freezers full of Wegman's brand ice cream. 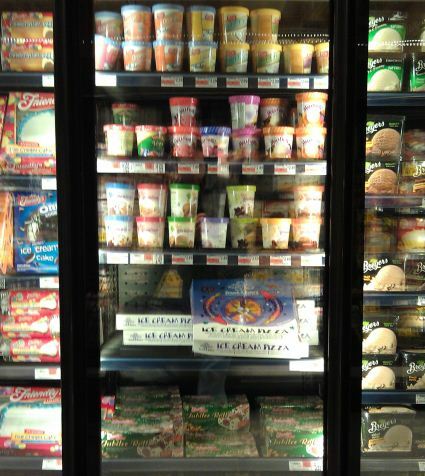 Low fat, extra churned, premium pints... Oh, yeah, another bone to pick with Wegman's. So they've got several neat looking pint sized premium flavors like peanut butter and jelly, but they were all a mess. Every flavor I choose was leaking out the side. I drove all this way and your ice cream is a mess? not cool. Even worse, they are still trying to pawn this stuff off on people. Not everyone is going to notice the chocolate smudge on the side til they get home, and at that point they wont want to bring it back. It would have been one thing if it was one flavor (hey, stuff happens), but it was every single flavor I picked up. Ok, enough venting for one post. Here is what I brought home. We've got 2 gelato pints from Perry's, a pint of Wegman's premium stuff, a flavor from Yovation, and a flavor from Hola Fruta. Oh how I have missed Hola Fruta! Oh, I also have a larger container of Wegman's black raspberry light ice cream too. Stay tuned! Oh, to the people who drove in an RV for the opening of Wegman's two months ago? Soooo totally not worth the hundreds of dollars you spent on gas. Wegman's has it's good points, but I'll stick with Market Basket. On Second Scoop Visit: We were trying to waste a little time, so we stopped in again to see if they had a few things for my son. As was my original impression, they have some things, but not a ton. While we were there, I also decided to count the ice cream freezers. 21 small freezer doors in all (not 6). That said, I still wasnt impressed. Actually, it's 22 because the freezer on the end is jam packed with Perry's Limited Edition Zero Visibility Ice Cream. It's not a bad selection, I just wanted Perry's. Lots and Lots of Perry's! Dubba I don't have a Wegman's near me but my coworker does and brought me in a pint of that PB&J -It's amazing and even tastes good on saltines (like a sandwich)..A must try for you! AH! You should come to a Wegman's in Buffalo, NY! It is a very, very different experience. The Wegman's I shop in has an ice cream aisle which truly does extend as far as the eye can see-well stocked with our hometown Perry's of course. I will agree that it is expensive; however, for the overall experience of shopping, it truly wins over every other grocery store in our area. Plus, they have a virtual monopoly in our area! We love our Wegman's and we frequently brag about them up here. We do love our food and our Wegman's! Try their name-brand products! In many cases they taste better than big-name brand products. I recommend their pasta sauces and ice cream-which just happens to be made by Perry's. I also recommend generally avoiding Wegman's at holiday times and busy times of the day-you may lose your ankles to a soccer mom talking on a cell phone... Love your blog! Happy Holidays from a Wegman's lover and enjoy the rest of your Perry's! We are getting a Wegman's in my area in summer of 2012 and I'm so excited. I have shopped there before so I don't think I'll be disappointed. I hope you had a great Christmas with your family. Looking forward to all your reviews in the new year! Thanks everybody. It was nice inside and if the ice cream aisle had been like twice as big, my rant would have been totally different. Hopefully their ice cream stock with have turned over by the time I go back. I'll never understand people who comment on 8 year old reviews that are clearly written in the moment. If you actually read this blog, you would know I am a fan of Wegmans.